We understand that every property is different and none more so than those fitted with original timber windows. 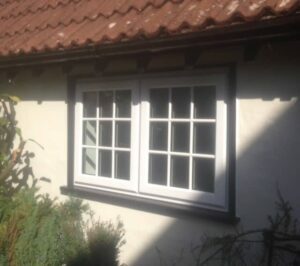 Many homes fitted with original wood windows need these replacing with cost effective and low maintenance alternatives. Newlite are one of only a few companies that can offer a unique timber effect window in low maintenance PVCu. Not only do our windows give you all the advantages of high specification modern windows but at the same time have the right design to keep them looking totally authentic. Discover our new flush sash windows. Our innovative flush sash window replicates your original timber windows perfectly. Opening sashes are recessed within the frame rather than overlapping it. This unique design feature coupled with our innovative foils and colours creates a truly authentic looking window. Our unique timber effect flush sash window is the first of its kind in the UK and is guaranteed to add a wow factor to your character home, cottage or traditional property. Energy efficient, highly secure and beautiful windows. Our exclusive flush sash windows benefit from excellent energy efficiency thanks to its innovative multi chamber core. High security is at the core of our flush sash timber effect windows. They pass the strongest tests of Secured by Design and PAS24:2012. Internal glazing beads add further peace of mind as they cannot be removed from the outside. Every component in your new windows has been subjected to stringent test ensuring they remain secure, weather resistant and weather tight. Our coastal location means our windows and doors are often exposed to the elements and we take this into consideration in providing you exactly the right window. You can further enhance the character of your property by opting for our wide range of astragal or Georgian bars. High specification glass and standard. Our windows benefit from the latest in glass manufacturing and technology. As standard your windows will come with high specification double glazed units. Internally all come with Argon gas fill as well as warm edge spacer bars and specialist coatings on the glass to enhance the energy efficiency of the windows. Our range of flush sash windows are crafted with meticulous attention to detail and care. Newlite exercise the same attention to detail with your installation. You will benefit from our many years experience and expertise giving you a stunning installation that will look good for many years to come. Contact us to find out more about our unique range of timber effect windows.